The primeval galaxy was identified by combining the power of the NASA/ESA Hubble Space Telescope and CARA's W. M. Keck Telescopes on Mauna Kea in Hawaii. These great observatories got a boost from the added magnification of a natural "cosmic gravitational lens" in space that further amplifies the brightness of the distant object. 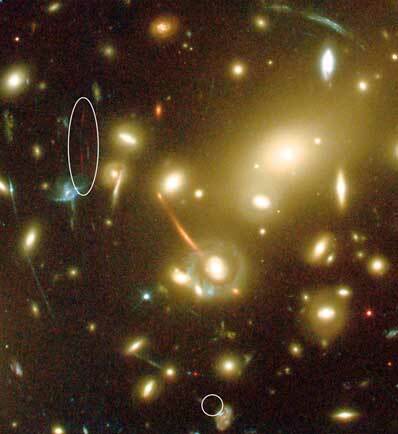 The new galaxy was detected in a long exposure of the nearby cluster of galaxies Abell 2218, taken with the Advanced Camera for Surveys on board the Hubble Space Telescope. This cluster is so massive that the light of distant objects passing through the cluster actually bends and is amplified, much as a magnifying glass bends and magnifies objects seen through it. Such natural gravitational "telescopes" allow astronomers to see extremely distant and faint objects that could otherwise not be seen. The extremely faint galaxy is so far away its visible light has been stretched into infrared wavelengths, making the observations particularly difficult. "As we were searching for distant galaxies magnified by Abell 2218, we detected a pair of strikingly similar images whose arrangement and colour indicate a very distant object," said astronomer Jean-Paul Kneib (Observatoire Midi-Pyrenees and California Institute of Technology), who is lead author reporting the discovery in a forthcoming article in the Astrophysical Journal. 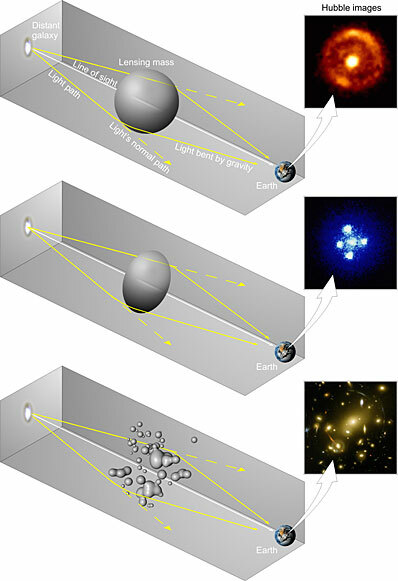 Analysis of a sequence of Hubble images indicate the object lies between a redshift of 6.6 and 7.1, making it the most distant source currently known. However, long exposures in the optical and infrared taken with spectrographs on the 10-meter Keck telescopes suggests that the object has a redshift towards the upper end of this range, around redshift 7. Using the combination of the high resolution of Hubble and the large magnification of the cosmic lens, the astronomers estimate that this object, although very small - only 2,000 light-years across - is forming stars extremely actively. However, two intriguing properties of the new source are the apparent lack of the typically bright hydrogen emission line and its intense ultraviolet light which is much stronger than that seen in star- forming galaxies closer by.